Note: The information on this page is only applicable to those sites for which Day-Based Billing Mode - Beta has been enabled. This feature allows you to choose between day-based billing and millisecond-based billing in Chargebee. Contact support@chargebee.com to enable it for your site. If you are not part of this Beta program, please refer to this page to understand proration in Chargebee. Chargebee allows you to choose the billing mode for your site. This is the granularity of time to which your services are billed. You can account for services either to the day or to the millisecond. In other words, when you bill your customers, the minimum accountable duration can be either a day or a millisecond. Changes can be made to subscriptions in the middle of their terms. For example, a subscription may be upgraded or downgraded to a different plan, or quantities may be added or removed. Since this introduces a change in the price of the subscription, prorated credits and charges can be raised to ensure proper billing. Since billing mode can be either day-based or millisecond-based, proration follows suit. So when proration happens, the minimum accountable duration for the charges or credits is either a day or a millisecond, as set by billing mode. This is a beta feature that is only available on request. See the note at the top of this page. 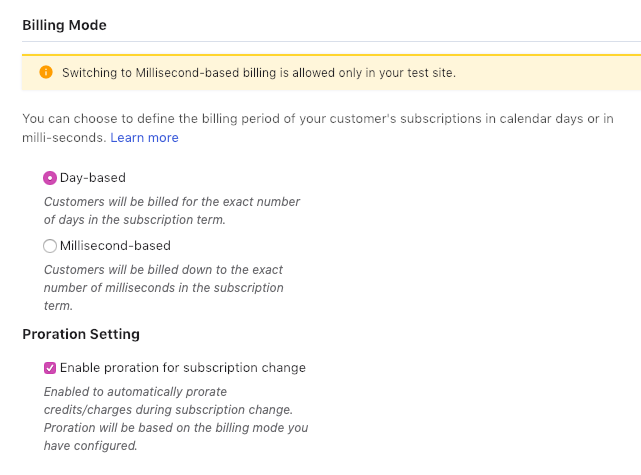 You can choose either calendar day-based billing or millisecond-based (default) billing for your site. Billing is done to the calendar day. In this mode, whenever a subscription starts, regardless of what time it actually started, its start timestamp is set to the beginning (00:00:00.000 hrs) of the day and the end timestamp is set to the end (23:59:59.999 hrs) of the last day of the billing period. These times are only indicative; any proration calculations in day-based billing mode do not use the time component. Billing is done to the millisecond. This means that subscription terms can start at any time in Chargebee. The end of the term timestamp is one plan billing duration after the subscription start timestamp. For example, a subscription could start at July 23, 2019, 12:30:33.756. If the billing period of the plan is a month, the end of the term would be at Aug 23, 2019, 12:30:33.755. The configuration here allows you to choose the default behavior while changing any subscription. Checking the box enables proration-during-subscription-change by default. While actually changing the subscription, you can override the default setting by using the Apply prorated credits and charges checkbox on the change subscription page. Proration for subscription cancellation must be configured under subscription cancellation settings. Another occasion when proration can be done is when you change the next billing date or — in case of a non-renewing subscription — change the cancellation date of a subscription. Proration does not apply to coupons that accompany your plans. As rebates on the items in your plans and addons, coupons are not prorated. As noted above, Chargebee only provides time-based billing. This kind of billing is suited for services that are billed based on time-of-use such as SaaS. If you are selling subscriptions for physical goods which are billed based on deliveries, please disable proration. Changing the billing mode on your test site is allowed but for switching billing modes on the live site, please contact support@chargebee.com . Here's how changing the billing mode affects Subscriptions. Warning: Performing this switch results in the loss of timestamp information from the subscription data: any start and end timestamp data more granular than a calendar day is lost and cannot be recovered. Switching back to millisecond-based billing is thus not possible. Since day-based billing mode accounts subscription terms in units of calendar days, on switching to it from millisecond-based billing mode, all start timestamps in Chargebee such as subscription start/activation/renewal timestamps and trial start timestamps are changed to the beginning (00:00:00.000 hrs) of their calendar days. Further, all term end timestamps in Chargebee are changed to the end (23:59:59.999 hrs) of the previous calendar day. Again, these times are only indicative; any proration calculations in day-based billing mode do not use the time component. Note: Though renewal times are aligned to the start of calendar days, it can take up to 2-3 hours for the renewal to actually go through due to the scale of the operations. When switching from day-based to millisecond-based billing, the subscription data is unchanged. Further, billing and proration for the site happens to the millisecond. This switch is only allowed on the test site. When prorated credits are raised against invoices, the amounts are always calculated as per the billing mode in which the invoice was generated. For example, if an invoice was generated in millisecond-based billing then even after switching the site to day-based billing, any prorated credits against the invoice are still calculated to the millisecond. The status of the current term's invoice. When the current term's invoice is in a Payment Due or Not Paid state, then during subscription change, the credits generated will be of the type Adjustment and these credits will automatically be applied to this invoice and the invoice's due amount will get reduced. If the current term's invoice is in a Paid state, the credits generated will be of the type Refundable and will automatically be applied to the future invoice(s). We now discuss some real examples in Chargebee to demonstrate proration. The examples, save the last one, are for day-based billing. Subscription was created with the plan quantity set to 2. In the middle of the month, the plan quantity was downgraded to 1. In this case, credits for the quantity of 1 for the unused period of 15 days would hence be generated. Since the current term's invoice is in the Paid state, the credit note would be of the type Refundable. Adjustment Credits $10 x 1= $10 will be created and adjusted against the Payment Due invoice. The final invoice amount will get reduced to $50. Subscription was created with the plan quantity set to 3. In the middle of the month, the quantity was downgraded from 3 to 2. Since the current term's invoice is unpaid, a credit note of the type Adjustment will be created for the price of 1 quantity and automatically adjusted against the invoice's due amount. Say the quantity for the subscription is reduced to 2 on Sep 15th. Prorated amount for the unused service: plan price x unused quantity x fraction of time unused = $30 x 1 x 0.5 = $15. So the total amount for the term changes to: invoice amount - prorated amount for unused service = $90-$15 = $75. Since $80 has already been paid, a refundable credit note for $80-$75 = $5 is generated. Also, an adjustment credit note for the original unpaid amount of $10 is also generated. Credit Note will not be generated. Subscription was created with the plan quantity set to 1. The plan quantity was then upgraded to 3. In this case, no Credit Note will be created and an invoice will be generated for the two additional quantities. The way proration is calculated and applied in the case of a Plan Quantity Upgrade, remains the same regardless of the Invoice status (Paid, Payment Due, Not Paid, or Partially Paid). Prorated Refundable credits $40 will be created, out of which $20 will be applied against the above invoice. The remaining credit balance ($20) will be available for future use. Subscription was created with the plan (Plan A) of amount $60. The subscription's plan was then downgraded 10 days later to another plan (Plan B) of the amount $30. In this case, an invoice of $20 will be generated for the Plan B's amount for the period of 20 days and prorated Refundable Credits of $40 will be created for Plan A's unused period. Refundable Credits will then be automatically applied to the $20 invoice. If the previous Invoice was unpaid, Adjustment Credits will be created and applied to this invoice. The following examples show how proration happens when changing the quantity mid-term for plans with tiered, volume or stairstep pricing. Say a customer subscribes to Plan A starting Jan 10, 2019, 16:02:35.480 hrs. Subscription start timestamp: Jan 10, 2019, 16:02:35.480 hrs. Subscription end timestamp: Feb 10, 2019, 16:02:35.479 hrs. This period of 31 days has 2,678,400,000 milliseconds. Subscription change timestamp is: Feb 1, 2019, 10:03:43.223 hrs. The remaining term duration ( R ) is therefore: 9 days, 5 hrs, 58 min, 52 s and 257 ms. = 799,132,257 ms.
Can I have products with different billing modes in Chargebee? No, billing mode is a site-wide setting and cannot be changed for specific plans or addons in Chargebee.